Shine bright like a diamond. Those words from the great philosopher, Rihanna, have been taken to heart by one bike ride. In a city that’s more well known for exporting cars and a has perception of being a lunch bucket kind of town, there’s something happening in Windsor, Ontario, that most wouldn’t have expected. It’s a movement. A two wheel movement that’s moving the car down the pecking order and putting people and their bikes first. What started as a small gathering of a dozen (if lucky) people riding their bikes has now blossomed into a spectacle. A slowly rolling, brightly lit spectacle. 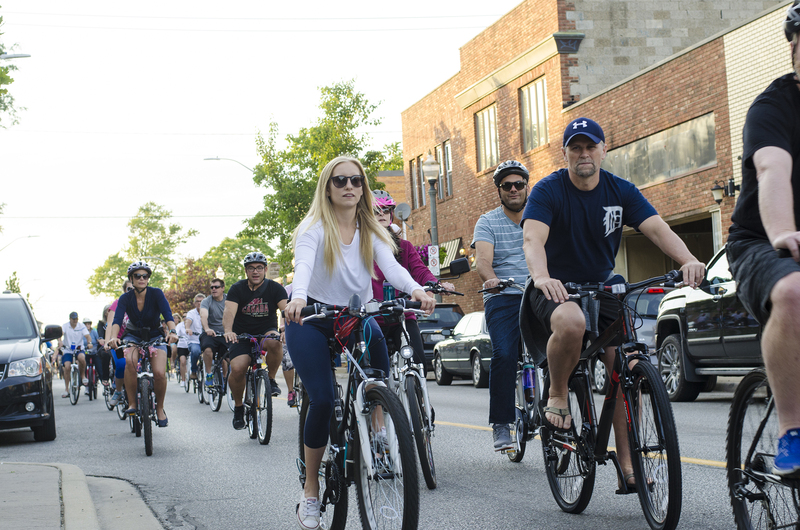 It’s Friday Night Lights, a bike ride through Windsor, that has grown exponentially since its humble beginnings in 2014. The concept of the ride is quite simple. Imagine hundreds of colourfully lit bicycles rolling by, bells clacking, as they partake in a pub crawl on two wheels. The pack take up the entire street, sometimes stretching several city blocks at a time. They’ve even received the support of the Windsor Police Services who provide auxiliary officers on bike to join the crowd and keep everything rolling smoothly. The ride takes place every other Friday from the start of May into October and has riders are constantly trying to outdo each other with their decorations on each ride. If you pay close enough attention, you may catch a glimpse of the couple on a tandem bike with custom built chandelier installed hanging over them as they ride. The event has become hugely popular, but, not just with a younger demographic that you’d expect. In fact, looking across the faces in the crowd you’ll see a wide spectrum of ages from young adults to seniors. And that’s the best part. You quickly realize it’s for anyone. All ages. All abilities. No judgement. Simply put, Friday Night Lights is a pub and grub crawl on two wheels throughout the city. You not only get to enjoy the company of good folks, you also can indulge in the food and drink of three great establishments visited along the way. Stopping by the Art Gallery of Windsor on a Friday Night Lights bike ride in Windsor, Ontario. The stops and routes along the way are always a secret and different with each ride. Visits have included everything from stopping to enjoy a beer and play beach volleyball at a local fitness club to a dance party at a wine bar. Pride festivals to beer gardens, Caribbean festivals to the local dive bars. 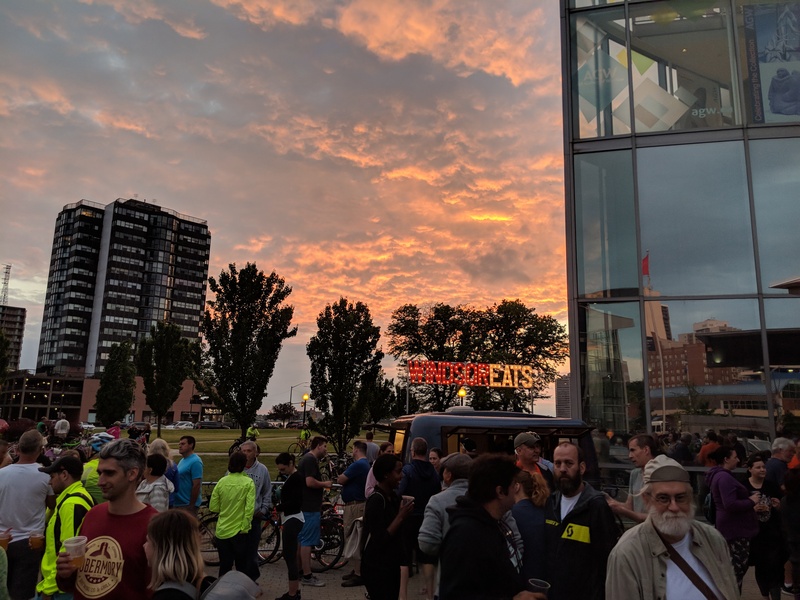 The ride has even stopped at the Art Gallery of Windsor for an outdoor celebration of the launch of an Andy Warhol exhibit. With as many as 300 plus people riding along, the atmosphere is fantastic. Several riders even equip their bicycles with sound systems belting some great playlists. “Changing the station” to hear the music you like is as easy as pedalling faster or slower to find another cyclist with a different song playing. There’s honestly no better way to explore the city.